December 7, 2007: Fighting continues to grow more intense in the north, with there being several hundred casualties on some days. The LTTE mainly attacks government check points, which tend to be prepared for this sort of thing. 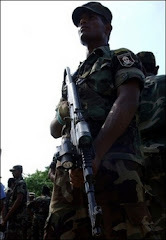 The army goes after LTTE defensive positions (trenches and bunker complexes). The LTTE are suffering 4-5 casualties for every soldier killed or wounded. There are occasional clashes in the east, but most of the action is in the north, where the LTTE is short of food, medicine, ammo, morale and just about everything else. December 6, 2007: In the north, LTTE terrorists used a claymore mine to hit a bus with hundreds of steel balls. Sixteen civilians were killed. December 4, 2007: Over 90 percent of the nearly 3,000 Tamils arrested recently in the capital, were released. But several hundred were evicted from the capital, and sent north to Tamil areas. The police continue to search for the LTTE terrorists who set of the two bombs in the capital recently. December 1, 2007: In response to the two suicide bombing in the capital, police have been searching Tamil neighborhoods in the area, and arresting those who were not supposed to be there. The LTTE has been fighting hard up north, to breach the government lines, and send terrorist teams south. Most of the terrorists are getting through as civilians, so the army is restricting those movements as well. There is much anger among the majority Sinhalese, at these LTTE terrorist attacks.